Our residents are saving money, our city is reducing greenhouse gas emissions, and our neighborhoods are growing stronger thanks to this program. 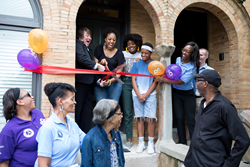 The Baltimore Energy Challenge celebrated its milestone achievement of making 15,000 Baltimore homes more energy efficient yesterday, August 8, with an in-home installation of energy saving devices and ceremony at the home of Ms. Roseanne Holmes in Reservoir Hill. The Baltimore Energy Challenge is a partnership between the Baltimore City Office of Sustainability, Baltimore Department of Housing and Community Development, Baltimore Community Foundation, and Civic Works. For the past three and a half years the Baltimore Energy Challenge has been funded by the Maryland Public Service Commission’s Customer Investment Fund to meet the goal of assessing and improving the energy efficiency of 15,000 homes across the City. An evaluation of houses served by the program shows an average reduction in energy use of 80 kWh per month per house. The Baltimore Energy Challenge’s two areas of focus include educating Baltimore City residents about ways to reduce energy use and training teams of Baltimore residents serving as AmeriCorps members to install energy saving devices in homes. The program enables residents to save money while making a positive impact on the planet and helps Baltimore City meet its goal of reducing greenhouse gas emissions. When upgrading a home, the Baltimore Energy team delivers a robust energy reduction plan that includes replacing light bulbs, wrapping water heaters, insulating hot water pipes, replacing shower heads with low flow systems and installing carbon monoxide detectors. They also provide residents with a wide variety of energy-saving devices that include LED bulbs, dimmable lights, power-strips, and nightlights with sensors, as well as radios and flashlights for emergencies. The Baltimore Energy Challenge was joined by key stakeholders, partners and community members at the 15,000th energy audit to celebrate this achievement. The Baltimore Energy Challenge teaches low and no-cost ways to save energy to Baltimore City residents, businesses, and schools. Our AmeriCorps members install energy and water conservation equipment in homes. Installations include programmable thermostat, energy-efficient light bulbs, low flow showerheads, pipe wraps, power strips, and more. The Baltimore Energy Challenge is a partnership between Civic Works, the Baltimore Office of Sustainability, and the Baltimore Community Foundation. For more information, please visit http://www.baltimoreenergychallenge.org. Civic Works is Baltimore’s urban service corps and an AmeriCorps program. Our mission is to strengthen Baltimore’s communities through education, skills development, and community service. Civic Works AmeriCorps members tutor and mentor students, create community parks and gardens, help homeowners conserve energy, grow food for low-income residents, rehabilitate abandoned houses, involve families in Baltimore City schools, make homes safer for older adults, and recruit volunteers. Civic Works also trains Baltimore residents for employment in the healthcare and green job industries. For more information, please visit http://www.civicworks.com.